Gabriel Garcia Marquez portrays in his novel “The General in His Labyrinth” the dramatic life of Simon Bolivar who, in his last moments says: “How do I get out of this Labyrinth?” For many years, Venezuelans have asked that very same question as our country fell into the abyss of economic collapse due to hyperinflation. Meanwhile, the Maduro regime denies the existence of a humanitarian crisis that becomes more evident every day in the pleas of patients in need of medicine and in the increasing difficulty to find food. During January, Venezuelans recovered hope when Juan Guaido assumed the interim presidency and the process of democratic restoration with broad national and international support. Recognized as the legitimate president, Guaido represents the most powerful threat to the Maduro regime, who holds the power hostage after the fraud of the 2018 presidential election. Maduro hasn’t even allowed the entrance of humanitarian aid provided by the international community and is responsible for the collapse of the electrical grid which, since March 7th, has brought the country to the brink of utter chaos. All this instead of stepping down peacefully and accepting that the world has abandoned him. After seeing the images of Venezuela now, it is easy to be pessimistic. Even more so when the crisis continues to escalate, and it is impossible to know what has happened after the writing of these words. However, the world has witnessed the birth of a new civic society, led by a legitimate president, willing to make any sacrifice, even if it means their own lives. The world is also witness to an usurper who commits and celebrates human rights violations. 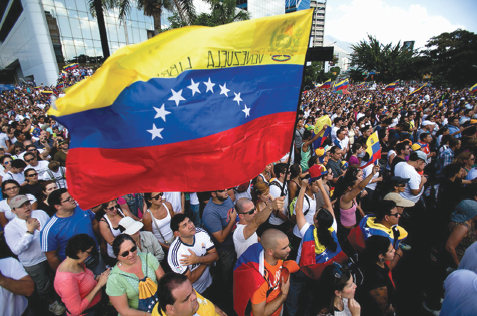 Amid this labyrinth, what remains for those who want to see Venezuela free? Hope, for sure. But a hope that is deliberate instead of naive. A hope based on the total commitment of a citizenry who has given everything and does not break, even in the face of darkness. which welcomes a broad range of viewpoints.